For those of us that are just tuning in and missed the big announcement: Kishiryu Sentai Ryusouger was announced as the 43rd Super Sentai series proceeding the currently airing Kaitou Sentai LupinRanger VS Keisatsu Sentai Patranger. 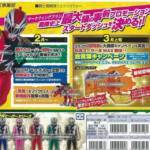 Clearer versions of the initial toy catalog scans have been trickling out since then, and thanks to some new pages that have been uncovered we have some new details regarding this forthcoming series. It’s been rumored for quite some time now that Super Sentai will be going on a bit of a break in February, that rumored break is now confirmed via these new scans. Kishiryu Sentai Ryusouger won’t be airing till March until then Toei will be releasing historical Super Sentai videos throughout February on YouTube. Rumour has it that Captain Marvelous/Ryota Ozawa of Gokaiger will be hosting hese videos, though nothing official has been confirmed regarding these videos, so please do take this with a grain of salt. 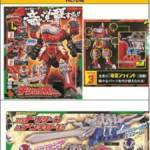 In addition to that, clearer scans of both the roleplay toys and mecha were also released. The scan shows us a glimpse at how Ryusouger will transform and it seems like the team will perform some sort of dance before initiating the change, an element very reminiscent of Zyuden Sentai Kyoryuger. There’s still a lot we don’t know about the new Sentai on the block, so stay tuned and we’ll keep you up to date as new info becomes available. In the meantime, make sure to hit the jump and join us in the discussion thread. Even More Kishiryu Sentai Ryusouger Images Released! New details are emerging about the 43rd Super Sentai series, Kishiryu Sentai Ryusouger! An official logo has been released for the series, giving us the best look yet at the new suits and the full appearance of the main Mecha, Kishi RyuOh. In addition, some extra information about the series’ collectible gimmick- the RyuSouls has been revealed. The Souls are small figures resembling dinosaur heads that can transform into medieval-knight styled figures. Each Soul unlocks a different power for the Ryusougers-along with special armor forms. 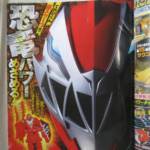 No release date has been confirmed at time of writing but if Super Sentai patterns hold, we can expect to see Kishiryu Sentai Ryusouger in late January/early February 2019! Stay tuned to TokuNation as we keep you up to date on this remarkable new series! 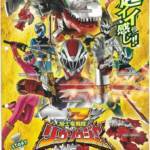 Kisiryu Sentai Ryusouger Fully Revealed! First Catalog Images Posted Online! At long last we have the first images of the 43rd Super Sentai team- Kishiryu Sentai Ryusouger! Digging back into the Toei well, this series appears to be DINOSAUR themed! *This new team will consist of five members- Red T-Rex, Blue Triceratops, Pink Ankylosaurus Green Sabertooth, & Black Stegosaurus. Each Ranger is referred to as a “Knight” in the listings. *The Ryusougers’ powers come from Ryu Souls– miniature device resembling dinosaur heads that transform into knights & can fit into their henshin device (the Ryusou Changer! This device activates with the phrase “RyuSou Cool!” Extra Ryu Souls are stored in the Ryu Soul Buckle. *Each Ranger is armed with the Ryu SouKen– a Gun/Sword sidearm. *The teams’ main Mecha will be Red’s T-Rex- which has a unique form, KishiRyuOh! Other Ryusougers can form weapons & armor for KishiRyuOh- when the first three Knights come together, a combination known as KishiRyuOh Three Knights! Additional combos are shown based on the other Knights- KishiRyuOh TigerLance and KishiRyuOh MiNeedle! Definitely some exciting times ahead for Super Sentai fans! Stay tuned to TokuNation as we keep you up to date on this remarkable new series! 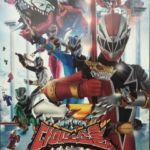 2019-2020 Super Sentai- “Kishiryu Sentai Ryuusouger” Trademark Filed! 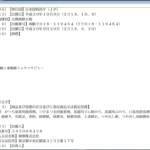 Toei has at last filed the necessary trademark for the next entry in the Super Sentai series! The 2019-2020 Super Sentai Series will be known as Kishiryu Sentai Ryuusouger! The name suggests a MEDIEVAL theme, centered around knights and dragons. Unfortunately, no other information regarding this new series is available at time of writing. Stay tuned to TokuNation as we keep you up to date on all Super Sentai reveals!